This will be a real thing at Fenway Park in a few weeks. Have you ever dreamed of going sledding at Fenway Park? Neither have we. But now that the team is building a sledding hill this winter we’re all in on the idea. 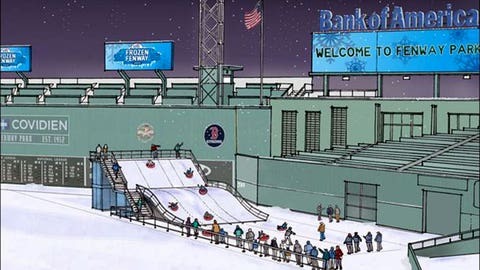 A 20-foot high sledding and tubing ramp called "Monster Sled" will be constructed at Fenway Park as part of the 2014 Frozen Fenway event. The sledding run will be located near Fenway’s Green Monster left field wall and will be 75 feet long. It will have five separate paths that end near the Red Sox bullpen. The attraction will be open for hourly rentals for groups of up to 100. Call 617-226-6791 or email events@redsox.com for rental details. Details on how Boston residents can get tickets for the hill will come from the mayor’s office. The Frozen Fenway event runs Dec. 28 to Jan. 13. Too bad Manny Ramirez is no longer with the team. We know he’d be down for something like this. One question, though: How much will the hot chocolate cost?